How to convert multiple excel files to PDF using Excel VBA - This is one of the most asked question on any excel discussion forum. In analytics industry, reports are generally generated in excel and powerpoint format. But companies generally prefer delivering them to clients in PDF format. A medium sized project requires conversion of hundreds of excel files to PDF. How to check if the add-in is installed? Click on Office button, go to Save As button. If PDF or XPS is showing in the list, it means it is installed on your system. It creates a PDF file of the whole workbook from workbooks in a folder. It creates a PDF file of the selected worksheet from the workbooks in a folder. 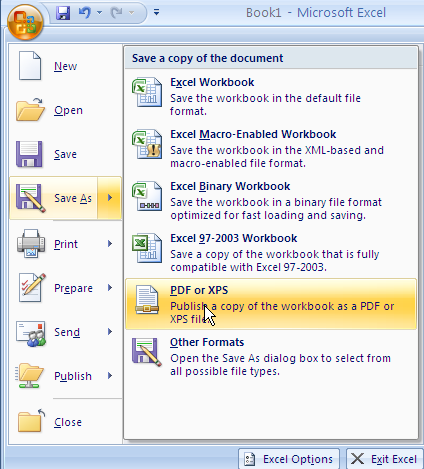 It creates a single PDF file of two selected sheets from the workbooks in a folder. 1. Open Excel . Press Alt + F11 to open the visual basic editor. 2. If you wish to make any changes in the code, select a module where code is placed. Q. How to create a PDF report of a particular range of the worksheet? Sol : Download this workbook. Open it and press Alt + F11. 17 Responses to "Excel Macro : Convert Multiple Excel Files to PDF"
Thanks for stopping by. I'm glad you found it helpful! Great work man. Thanks very much. It's absolutely okay. I appreciated you asked me for permission! converting excel to pdf file on pc online can be download on this very well website http://www.tagpdf.com/online/convert-excel-to-pdf/, this is a wonderful converting excel to pdf file online, and There are only three steps to converting excel to pdf file online easily. Hi I need to do the procedure for converting range of sheets in a workbook for a list of many workbooks with different sheet ranges specified within those workbooks. (not all files within a directory) I am having a lot of trouble trying to alter your VBA code to get this done. I currently have a list of the files and a list of the sheet names associated with those files but can't figure out how to loop the code across each workbook and each sheet range. How can anyone make sure that any (or your) downloadable macro doesn't contain any malware/spyware? It sure is great to learn from others while using VBA and Macros, but safety first right? LOL. I can expect this kind of response from 'anonymous' user only. The intend of this article is to share knowledge with others, not spreading malware/spyware. Always use anti-virus. Don't trust anyone!